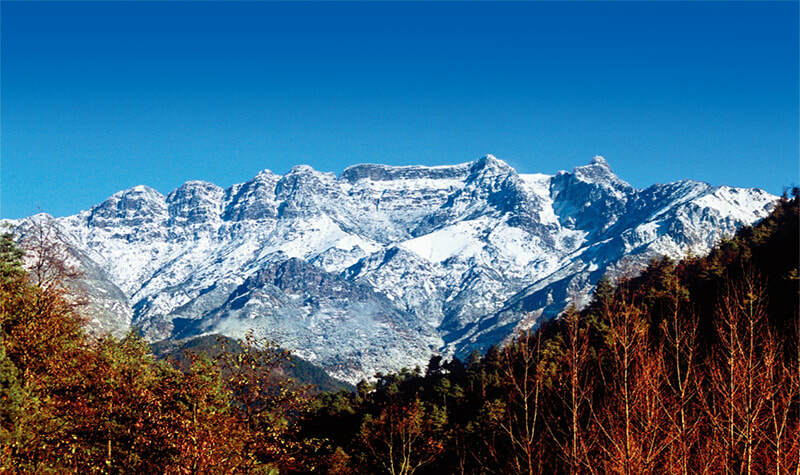 Standing some 200 kilometers north of the City of Kunming, Jiaozi Snow Mountain covers an area of 119 square kilometers. Several peaks in the mountain area look like a sedan chair in the distance. The relative height difference of the whole mountain is more than 3,000 meters. With a unique natural landscape, it is the lowest snow-capped mountain in winter in Yunnan. There are dozens of azaleas in blossom on the mountain in spring. Several types of ecosystem coexist on the mountain such as Alpine lakes, the alpine meadows, etc. Jiaozi Snow Mountain is home to Yunnan yew, Megaarpaea delavyi Franch, Daphne feddei, Berneuxia thibetica Decne, Paris luquanensis, forest musk deer, gorals, serows, otters, weasels, pangolins, besras, crested serpent eagles, collared scops owls, lady Amherst’s pheasants, Asian barred owlets, Temminck’s tragopans, and common kestrels and the like. Snow-covered landscape on the mountain is breathtaking. In winter, you can play with snow. In addition, the mountain is a paradise for photographers. It is ideal for photographing the sunrise, and the sunset around the year. In summer, you can take great pictures of the clouds and the azaleas. From the end October to the end March, you will admire the frozen lakes, frozen waterfalls, rime and snowfields there. If interested, you can enjoy skiing there. As it always takes around 6 to 8 hours to explore the mountain, it is recommended that you stay overnight at one of the lodges at the foot of Jiaozi Snow Mountain the day before your tour date if you are planning to take pictures of the gorgeous sunrise and the clouds. It is suggested to take enough food and drinking water beforehand, especially some high-calorie food, such as chocolate, cookies, etc to replenish one's strength during the climbing-up. Please be sure to walk along the plank road, especially in winter, out of safety. If your conditions are not for climbing, it is recommended that you take a cable car up to the Daheijing (大黑箐) from Xiapingzi (下坪子). If you enjoy climbing, you could start your trip from Xiapingzi after the shuttle bus takes you there. Generally speaking, it always takes some 3 hours to climb up to the top of the mountain. During the climbing-up, please hike at a slow pace in case that you would get altitude sickness. You will be amazed at the amazing views on the top of the mountain. If your conditions allow, you could hike downhill to appreciate the scenery you haven’t found in the uphill cable car. If you are planning to visit Jiaozi Snow Mountain for photography purposes, the best time to visit is during the sunset and the sunrise. The best months to visit are from November to the end March. As Jiaozi Snow Mountain is a less-known scenic area, there is no direct buses from Kunming to the mountain. The only option is to rent a vehicle. It is not allowed to enter the mountain from 15:00 on. The last uphill shuttle bus starts at 15:00 and the last downhill shuttle bus departs at 17:30. Please wear enough warm clothes. In winter, if it is covered with snow, the plank road will be slippery. It is suggested to take an alpenstock with you. In winter, the elder and children are not recommended to climb the mountain as it is slippery. Interested in visiting Jiaozi Snow Mountain on a Tour? Wendy Wei Tours offers a variety of different packaged tours as well as custom tours including Jiaozi Snow Mountain, among other attractions and destinations. To find out more, please visit our Tours page or Contact Us directly to find out more.